FAQs / How can we use ZoomChess in our Homeschool co-op? ZoomChess offers discounts to Homeschool group subscriptions. 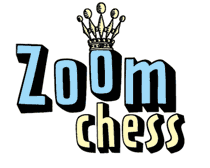 You can get a year of ZoomChess for as little as $25 per child for groups of 5 or more. Using ZoomChess in a Homeschool group setting can become very lively and social, with kids huddling around one computer figuring things out as a team. You can access the lessons under “Topics” in the Training Room, if you want to watch and discuss a specific subject as a group. Then the kids can each practice the concept within their own ZoomChess account, or on a physical chess board – together. You can use ZoomChess to teach groups of Homeschool kids with or without a chess coach. This can be directed by a Homeschool parent who is an experienced chess player. But often it is a parent who is a chess novice, but is eager to learn right along with their children. The beauty of ZoomChess is that it enables even very young children to progress quickly, and continue learning regardless of the playing ability of their own parents. Life is a kind of Chess, with struggle, competition, good and ill events.